The Relentless Reader: OMG! It's my ONE YEAR BLOGOVERSARY! OMG! It's my ONE YEAR BLOGOVERSARY! You guys! You guys! I'm so excited! "Hey sis, I'll look into that." So, I started this blog. I needed a place to talk about books and I made my own space. I didn't know if anyone would read my words or care about what I had to say. Since then I have had THE MOST FUN! I've met the BEST bookish people. I've participated in the BEST bookish events. Thank you so much to YOU guys. Thanks to the people who read this blog. Thanks to the people who chat with me on Facebook and Twitter. I knew my bookish people were out there. I'm so glad I've found you. Now, to the fun stuff! Redbery Books is a lovely independent bookstore in my neck of the woods. They have generously offered to sponsor a giveaway to celebrate one year of The Relentless Reader! 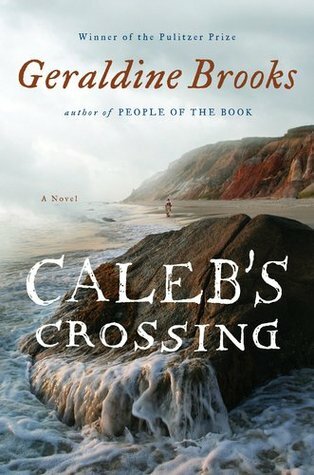 Up for grabs is a signed copy of Caleb's Crossing by Geraldine Brooks and a $20 gift card to Redbery Books! How awesome is that? Enter! Thanks for hanging out with me this past year. I hope you'll stick around! Thank you Ellie, I am! I'm going to be strutting around today. Woot! Thank you Megan! :) I'm a happy gal today! Aww, thanks Melinda!! It's been a great year! Congrats on your 1 year blogoversary...it goes so fast, doesn't it? Thanks! I can't believe how fast this year zipped on by! Congrats, Jennifer! The book blog world is so awesome -- I know I was thrilled to finally find My People. Thank you Rayna! This community is fantastic, thank goodness you are all out there! Oooooh! I've read other Kearsley- I'm adding this to my list now! Congratulations on your one year!! I enjoy your blog! My favorite book in 2013 was (adult) And the Mountains Echoed by Khaled Hosseini and (children's) Every Day After by Laura Golden. :-) I LOVED Caleb's Crossing and would love to have a signed copy. I love everything by Geraldine Brooks! Thanks Holly! I just won a copy of And the Mountains Echoed and I cannot wait to read it! I'm so glad you started your blog! Otherwise, how would I have found you? And our not "meeting?" That would have been tragic. Happy Blogoversary to the CERTIFIED AWESOME Jen!!!!! So excited for you! My favorite book so far has been The Interestings by Meg Wolitzer, but I'm in the middle of Philipp Meyer's The Son right now and it's coming up close! Thanks Shannon :) I loooved The Interestings too. I keep hearing lovely things about The Son as well. I'm going to have to get to that one! Thanks for an awesome giveaway! I'm so happy to have found you through Armchair BEA. My favorite book of the year so far is "Life after Life" by Kate Atkinson. You're welcome :D I'm glad we found one another too! Life after Life...oooh, I liked that one a lot! Thank you, thank you! :) I thought that was a funny one too! My favorite book so far this year is a tie between The Golem and the Jinni, and Into the Wilderness. I saw some reviews claiming that Into the Wilderness was just Outlander fan-fiction, but I didn't perceive it that way at all. I actually enjoyed Into the Wilderness much more than Outlander! YAYAYAYAYAY! To one of my fave bloggers. A super fantastic one-year 'versary! Oh and I'm thinking Life After Life was my favorite this year! Thanks Monika :) I loved that book too! LOL to that conversation between you and your sis. Too funny, but how true too. Congrats! So glad you joined the blogosphere and we have someone fantastic to talk good books with! Thanks for the chance to win. My favorite book(s) this year? Sarah's Key and Little Women. Thanks so much Tanya :) It's been so much fun. Those are both great books, awesome picks! Thank you Greg :) Thanks for visiting! Thanks :D I'm going to look that book up. It sounds familiar but I can't place it. And one year ago, the book blogging world became a better place. CONGRATULATIONS on your blogoversary! Oh my gosh Michelle, thank you SO much!! Congratulations on your blogoversary! I loved both Cascade and Tiger in Red Weather. I love Geraldine Brooks by the way. 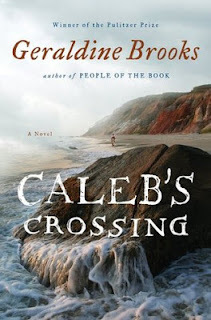 I have read Caleb's Crossing (it was great) and would love to have a signed copy! Congratulations! Finding out there was a community of people who actually liked to talk about books was a revelation to me too! I have several favorites this year: Looking for Me, Written in Red, and The Apple Orchard to name a few. Congratulations on 1 year of blogging! What an achievement!! My favorite book would have to be 11/22/63 or Looking for Me. Thanks :D You're the 2nd person to mention Looking for Me. I need to get to that! Thanks so much :) I appreciate your visit! She's pretty brilliant, for a little sister ;) Thanks so much!! Happy 1st anniversary! I can't believe your blog has only been up for a year... you have such a following! The best book I've read this year is "Fragile" by Lisa Unger. I reviewed it on my blog, but it just truly is a great read. Mystery, family saga, character building... it's at the top of the list so far! Thanks so much :) I've sure met some fantastic folks! I lure them here with cupcakes, mauahahaha! I'm going to look that book up, thanks! Thank you from the bottom of my heart Trish. Your esteem means the world to me :) XOXOXOX! Hooray and congrats! I don't doubt there are many more fun years to come. Congrats! You've had quite a successful year it seems! Love your blog and glad you're a member of this amazing community. Looking forward to reading for many more years. I can relate - although I still thoroughly harass my FB community with numerous book related postings. Congrats on one year! It's been a blast following your blog! Oh and best book so far "Z: A Story of Zelda Fitzgerald." Ha ha, good for you! Keep it up :) You know I have my own blog page on FB. Now the only people I harass are the ones that WANT TO BE, lol. I keep hearing great things about Z, hope to get to it one of these days! My favorite books so far....maybe Life After Life? Or the Chaos Walking series perhaps. Can I say a whole series?? You can say whatever book/books you want :D I'll have to look into that series. Life After Life was incredible. Congratulations!!!! Soooooooo exciting and I love that you're doing it with a giveaway! You should also treat yourself to a glass of wine, maybe some cake? You know what's sooooo fun? Me, you, and Allison have blog birthdays all within a few weeks of each other!!!! Mine's July 8! My favorite book this year. . . oy. . . Maybe The Song of Achilles? Did I read that this year? Or was that 2012? I don't even remember. . .
Ah better :) I knew for sure that your celebration was coming up but I wasn't sure about Allison's big day. Very cool! Thank you Kathy :) I really hope so! Happy Blogiversary! I remember the thrill of my first year blogging. Glad I discovered your blog. You're a fun gal! Congratulations! I think I've been following you almost from the beginning and I've enjoyed watching you grow! Cheers to your success and to all the awesomeness I know is sure to come! Thank you, thank you! It's been a great year :) I know you have an anniversary coming up too! Yay! My favorite so far has been CLOUD ATLAS by David Mitchell. Happy Blogoversary! My first Blogoversary is coming up soon, too! Congrats! Mine is coming up in August so I am starting to feel the same excitement you're experiencing! YAY! Thanks so much Lydia! I don't read many cookbooks but I should probably start, lol. I need all the help I can get! Jennifer, so glad to have met you! You are an awesome commenter, and your enthusiasm is contagious. Happy blog-o-versary! Thanks so, so much! I do get a little enthusiastic about things that I love ;) Woot woot!! Congratulations, Jennifer. I love reading your blog and I'm surprised it's only one year old. Here's to many more years of blogging. Favorite book this year is the one I gave away in the Literary Giveaway Blog Hop: The First Book of Calamity Leek by Paula Lichtarowicz. Happy anniversary Jennifer! Your blog is such a superb part of the book blogging universe! Congrats! I love your blog! I don't post much but I do love it! :P Happy Blogoversary! Many more to come! I have read so many good books this year...old and new. My favorite book that was released this year was Murder as a Fine Art by David Morrell. An excellent historical mystery/thriller set in Victorian times. Thanks so much Michelle :) It's been one of the best things I've ever done! You've only been around for a year?! That's crazy! It feels like you've been around FOREVER! I am so happy your sister suggested you find a place to talk about books. You are one of my favorite bloggers. I hope you stay around for many years to come! :-) Happy blogiversary! Thank you so much!! :D You put a big 'ol smile on my face! When this post came up in my feed I was looking at the title with bewilderment. I expected you to have been blogging much longer than that, you seem to have accomplished so much on your blog! It feels like I just started yesterday. But then, on the other hand, it feels like I've been doing this forever ;) Thanks a million Jade!! Congratulations, Jennifer! You're doing awesome! (I know, I know, terrible grammar...) I'm really impressed by how much you've done in just a year. Well done! Hi Belle! Thanks :) I'm looking forward to your hiatus being over, I miss ya!! Congratulations on one year! Here's to many many more! HAPPY BLOGOVERSARY!!! I am continually amazed at the size of your readership after only 1 year. You go, girl!!! It's impossible to pick a favorite of the year. I don't think I could do it. How jerky of me to ask my readers to, ha ha! I am late to the party! I had technical difficulties when I made my attempt on your blogoversary. That being said, Happy Happy Blogoversary!! I'm so pleased I happened on to your site. It's one of my favorites and I am a "regular" here. The comment from your sister cracked me up. I can relate!! Love your Facebook posts also. Keep in mind that half of those comments are mine! ;) Thanks Bryan, you're a darling! Happy blogoversary! I love your conversation with your sister! Congratulations on your 1st year blog anniversary! How exciting! I love reading your posts. They always make me smile. :-) Here's to many more wonderful years of blogging! Thank you very much :) That's so nice of you to say!